Erica Tinnika Thomas, 43, fought a courageous battle most of her life and 'Never Complained'. Erica was born December 7, 1974 in Birmingham Alabama and departed this life March 19, 2018 very peacefully with her Mother, Judy Arrington Thomas, at her side. Erica is preceded in death by her father, Henry Sears Thomas. Erica was baptized at an early age continuing as a faithful member of Ephesus Seventh Day Adventist Church. 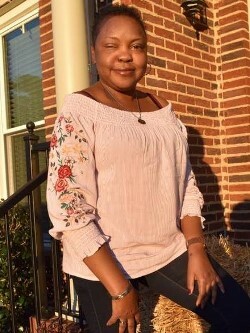 She graduated from Ephesus Academy, West End High School and attended the University of Montevallo pursuing a degree in Social Work. Erica's desire was to always be a help to anyone in need. While attending school Erica formed many lifelong friendships that remain today and were at her side till the end. A natural nurturer, Erica was a nanny and caregiver to many. She was affectionately known as Tee-tee or Nan-Tee. She was a church greeter with a beautiful smile for all she encountered. To know her was to love her. Erica enjoyed spending time with friends and family at dinners, shopping, reading, and traveling. Erica leaves to cherish her memories a faithful, loving mother, Judy Thomas, sister Sonya Thomas Pitts, brother, Vincent (Bridget) Thomas; nieces, Dominique (Justin)Hendricks, Chelsey Thomas , Lauren Pitts , Rayvn Thomas; nephews, Michael Logan Pitts ,and Vincent Jacolby Thomas; great nieces (Erica's Poo Poo's) Demi Jade and Jacsyn Layla Hendricks; Godmother, Marcina Cox; Godfather, Willie Fortune, and a host of loving family and friends..
Erica we miss you and you will forever be in our minds and hearts! Celebration of Life: Sunday, March 25, 2018 at Noon at Ephesus Seventh-day Adventist Church, 105 6th Ave North, Birmingham, AL. W.E. Lusain Funeral Home & Crematory.